Beautiful beachfront towns and culture-rich cities make up the Florida North Gulf Coast region. The cities are not so much fast-paced but ideal for families looking for relaxation mixed with a little cosmopolitan fun. Stay at a rental with a Florida North Gulf Coast vacation by owner arrangement and you'll not only make it an amazing vacation for the family, but it will truly feel like a home away from home. At almost any destination in this region, you can take peaceful walks on the beach, fish off a pier, or take in the sun. The wide, fresh sandy beaches along the calm, blue Gulf of Mexico are like no others. 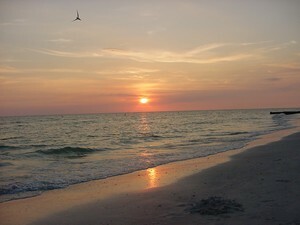 Settle in at Indian Shores for a quiet respite from the city life and escape from other major tourist hubs in Florida. The Suncoast Seabird Sanctuary, the largest bird hospital in the United States, is nearby and is open to visitors. Find a Florida North Gulf Coast vacation by owner rental at Indian Rocks Beach and enjoy the benefits of a small beach community close to many popular attractions. You'll also be within walking distance of the beach or recreational boating activities. The trove of barrier island getaways along the Florida North Gulf Coast includes Treasure Island. There are ideal white sand beaches you would never image are near a busting metropolitan area, but Treasure Island is a must consider for families with kids planning a vacation in the region. View a spectacular sunset and take your pick of restaurants in town, from beachfront grills to upscale dining establishments. That is if you don't feel like eating in at the Florida North Gulf Coast vacation by owner home. There's always the option of having a private family dinner cooked in the kitchen, and settling in for the night watching TV in the living room - opportunities the typical hotel or motel room doesn't provide. More laid back vacation spots include Madeira Beach, where you can stroll the boardwalk or browse the shops at John's Pass. Situated on the island of Long Key, St. Pete Beach offers a blend of lazy beach fun, restaurants, shopping, and history. Water sports such as parasailing and excellent fishing are just a sample of the things that can fulfill an extraordinary vacation here. Also consider the affordability of Florida North Gulf Coast vacation by owner properties, with the perks over hotel and motel rooms. The entire family will get to feel right at home at any of one of Florida's best beach destinations. The options for Florida North Gulf Coast vacation by owner homes range from upscale to comfortable family dwellings by the shore. Explore the array of choices you have by speaking to an owner today to plan a beach vacation you'll never forget. The convenience of being situated so close to the water is unbeatable, while the comfort and peace-of-mind will be well worth the money and special time away. Check out nearby Blue Mountain Beach , Clearwater , Clearwater Beach , Crystal River , Dunedin , Homosassa , Homosassa Springs , Indian Rocks Beach , Indian Shores , Isla Del Sol , Madeira Beach , Palm Harbor , Redington Shores , Ruskin , Spring Hill , St Pete Beach , St Petersburg , St. Pete Beach , St. Petersburg , Tampa , Treasure Island , Wesley Chapel .